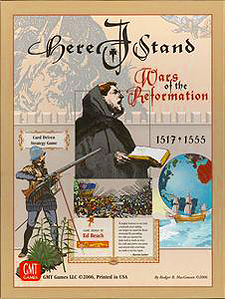 Here I Stand: Wars of the Reformation 1517-1555 is the first game in over 25 years.to cover the political and religious conflicts of early 16th Century Europe. Few realize that the greatest feats of Luther, Calvin, Loyola, Henry VIII, Charles V, Francis I, Suleiman, Magellan, Cortes, and Copernicus all fall within this narrow 40-year period of history. This game covers all the action of the period using a unique card-driven game system that models both the political and religious conflicts of the period on a single point-to-point map. There are six main powers in the game, each with a unique path to victory: the Ottomans, Hapsburgs, French, English, Protestants, and the Papacy. Here I Stand is the first card-driven game to prominently feature secret deal-making. A true six-sided diplomatic struggle, the game places a heavy emphasis on successful alliance-building through negotiations that occur away from the table during the pre-turn Diplomacy Phase. Backstabbing is always possible, especially because the card deck is loaded with event and response cards that can be played by any power to disrupt the plans of the powers in the lead. The game's lineage includes both SPI's A Mighty Fortress (1977) and The Napoleonic Wars (2002). From this base, the game adds mechanics unique to the 16th century, including New World exploration, Mediterranean piracy, publication (and burning) of religious treatises, and theological debates that can result in the burning at the stake of losing debaters. Here I Stand is an innovative game system, being the first to integrate religion, politics, economics, and diplomacy in a card-driven design.